A County Down shoemaker from Glen was captivated by the haughty, young woman from County Louth who would, clearly prefer to be back in County Louth, and refuses his offer of marriage. This elicits an attack, by the poet, on the miserly ways of Louth people who close their doors on travellers and strangers, in comparison to the abundant pleasures and welcome given in his native Glen in County Down. The poet would seem to have been familiar with another poem by the famous Omeath poet, Séamus Dall Mac Cuarta, who wrote in ‘Faoi Mhalaigh Shliabh Crúb’: Ní sheasann tusa cliu do na bodaigh as Lú, ‘S gurab e dúnadh a gcuid doirse a b’fhearr leo (You do not uphold the reputation of those Louth churls, Who prefer the closing of their doors). A once popular song in Oriel, it probably originated in County Down. A version was collected by collector Lorcán Ó Muirí (AHU pp.358-50) from a Mrs Larkin whose mother came from County Down. 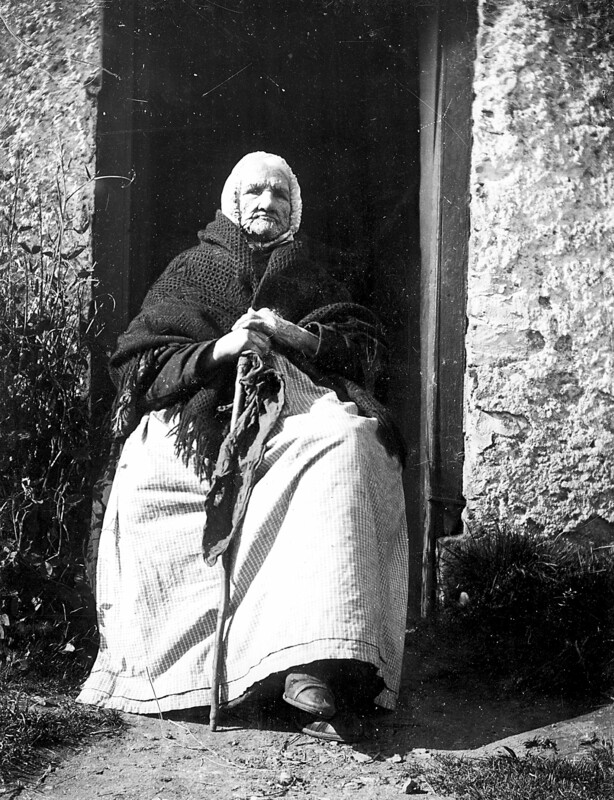 The collector Seosamh Laoide collected a version near Mullaghban from a woman who learned it in Mayobridge, County Down. Nonetheless, most versions were collected in Louth and Armagh. One version was collected by Mullaghban collector, Tomás Mac Cuilleannáin (AHU pp.365-6) in Dromintee which is near the Moyra Pass mentioned in the song. 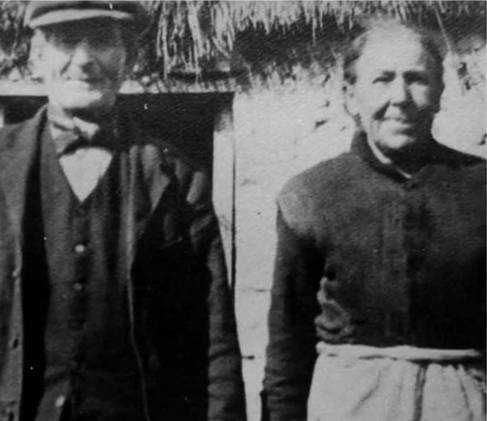 Tomás Mac Cuilleannáin left, with photographer Peadar Ó Dubhda second right. The source was James McCrink, from a family of musicians and singers, who gave the air to collector Luke Donnellan (AHU pp.361-63). The Glen mentioned in the song is on the north side of Newry (AHU pp.193-6). Thomas ‘The Feather’ McCrink and Briget McAleavey Dromintee. copyright McCrink Family. Thomas had ‘hundreds’ of songs in Irish. 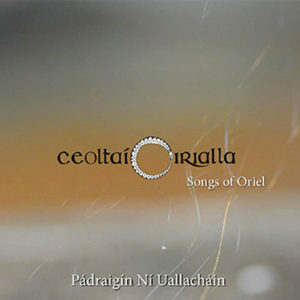 Lyrics and music were reconnected and interpreted by singer Pádraigín Ní Uallacháin who first recorded it on An Dealg Óir CD (Gael Linn 2003) with harp accompaniment by Helen Davies. The song is now in the repertoire of other traditional singers including Ríoghnach Connolly of County Armagh who learned it from An Dealg Óir recording and she can be heard singing it on Fleadh TV on youtube. 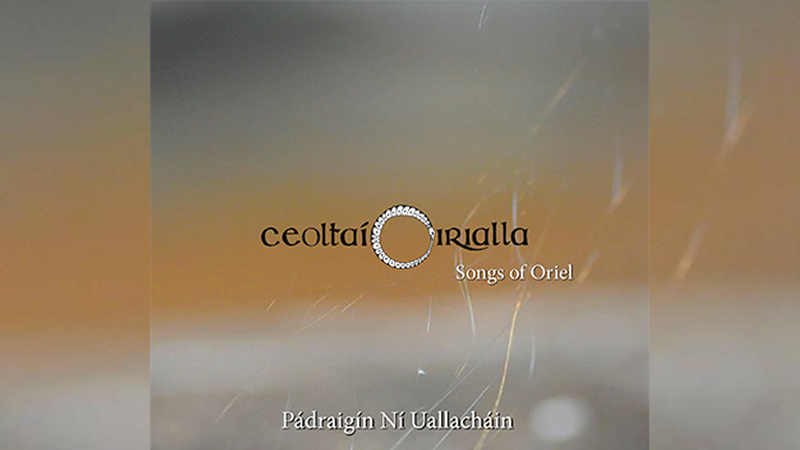 It is recorded on Ceoltaí Oirialla – Songs of Oriel CD 2017 with accompaniment from Helen Davies on harp. ‘An Cailín Beag óg as Lúghmhaighe’: Lorcán Ó Muirí MSS (p.38 ) among Ó hUallacháin papers from Mrs O’Hagan, Omeath. ‘An Cailín a’s Conndae Lúghmhaighe’: Ceolta Oméith (1920) 15 (‘A song from Iveagh – Co. Down’). Bóthar an Mhaighre: Gaelic Journal, Oct. (1902), 153, collected by J.H. Lloyd. An bpósfadh sí gréasaí as Contae ’n Dúin? Gur mhíle b’fhearr léi bheith i gContae Lú. Nuair a bhíonn(s) fáilte sa Dún do gach uile dhream. Nuair a bhíonn(s) fáilte sa ghleann ’na bhfuil mise ann. Beidh fáilte dhúbalta síos fán Ghleann. Would she marry a shoemaker from County Down? She’d a thousand times rather be in County Louth. When there’s a welcome in Down for everyone. When your crust of bread there is hard and ﬁrm? When there’s a welcome in the glen where I am in? Air source: Cailín Beg óg Leoghbhaidhe: County Louth Arch. Journal 1909. This is an unusual modal air with which was written down by collector Luke Donnellan from the fiddle playing and singing of James McCrink – one of the celebrated McCrink musicians of Dromintee (AHU pp.400-1).